Some preliminary geographic context. Image quality is none too sharp because I just did a quick-and-dirty jpeg export. Continent is currently ~3300 miles east-west and ~3600 miles north-south. Scale is easily changed if we desire, though I'd rather not go smaller. Yellowish region in the north is putative desert, darker green is forested(?) 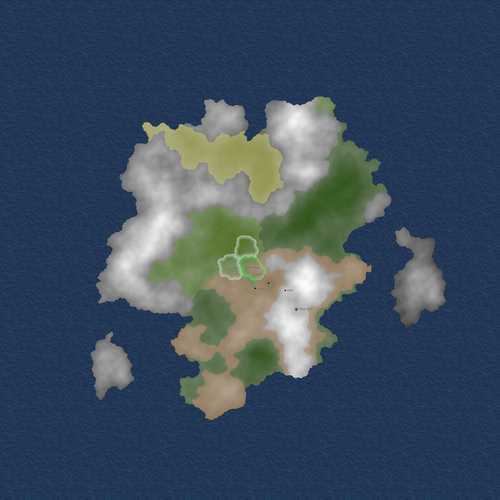 lowland, lighter green in the center is plains. Browns are hills, and the gray/white areas are either not-yet-colored hills (more gray) or mountains proper (more white). 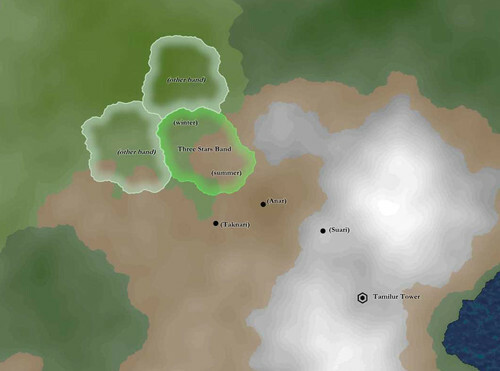 Three settlements in the hills/mountains, three nomadic bands (only one of which is playable) towards the plains, and the tower off in the southeast peaks. Note that the exact boundaries between hills and plains may be adjusted. So, assuming an unencumbered rider on a decent horse, the three permanent settlements are within maybe 10-25 days' travel of one another depending on which two you consider. The nomads are within about 8 days' travel of the Anar and Taknari in summer, and more like 25 days away in winter. As mentioned, neither of us really like Talbain. So… some alternatives. Kivaris - from Hungarian kisvaros, "small town"
Kinewhin - from Burmese kine taw kwin, "prairie"
Taltywin - from Burmese hc taat lwinpyin, "steppe"
Mykatain, Maikatyn, Makayin - from Burmese myaat hkainn pyin, "grassland"
Arbannin - from Burmese sar barr narr, "savanna"
Of these, I think I like Arbannin best. I like Arbannin or Makayin.